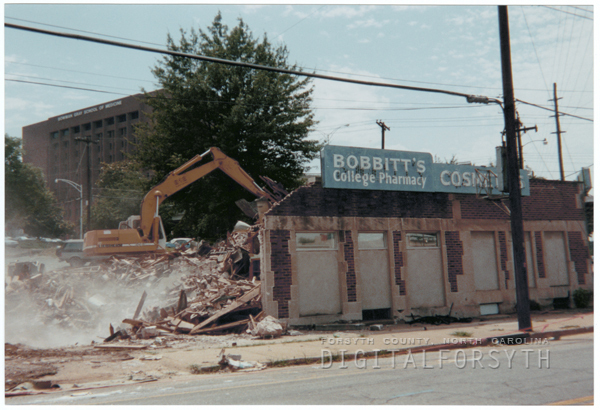 Destruction of Bobbitt’s College Pharmacy and Cosmetics on July 9, 1992. Pharmacy located on Lockland Avenue. My dad was a pharmacist until about 1960. Another piece of my childhood gone. My parents used Bobbitt’s as our family pharmacy for years. Not only would we get our prescriptions there, we also bought the Sunday NY Times every week. When sick as a child, they would deliver the medicine I needed. As an adult, a couple of years before it was torn down, the pharmacists helped fill a prescription I could not find anywhere else. I miss seeing the drug store when I drive up Hawthorne. Didn’t Earnest Rabil run the Pharmacy there for years?They had a nice gift shop downstairs in later years. Destruction of Bobbitt's College Pharmacy and Cosmetics on July 9, 1992. Pharmacy located on Lockland Avenue. The materials in this collection are made available for use in research, teaching and private study. Images and text may not be used for any commercial purposes without prior permission from Wake Forest University School of Medicine. When use is made of these images and texts, it is the responsibility of the user to obtain additional permission as necessary and to observe the stated access policy, the laws of copyright and the educational fair use guidelines. See Wake Forest University School of Medicine's <a href="http://www.wfubmc.edu/library/copyright/">copyright information</a> for details about copyright laws and fair use.